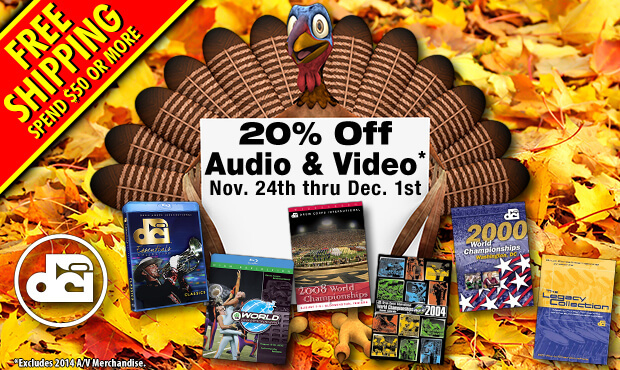 From now through Monday, December 1, take 20% off, and save on CDs, DVDs and Blu-ray discs from the extensive DCI audio/video archive. Plus, your order of $50 or more ships for free. Certain restrictions may apply. See store for details. Legendary World Championship performances with completely re-mastered audio and video up-converted to high definition Blu-ray disc. Promotion runs Monday, Nov. 24 through Monday, Dec. 1, 2014 at 11:59 PM ET and does not apply to 2014 World Championship audio/video, prior purchases or open orders. Free shipping is limited to delivery within the Continental U.S. excluding APO/FPO addresses. Entire order must ship to a single address. Offer does not apply to prior purchases or open orders. Customer is responsible for shipping costs on returned merchandise. Drum Corps International reserves the right to modify or cancel promotion at any time.